No doubt you are one of the 11.7 million unique monthly users like me who are addicted to this site. I pin in the morning as I read my daily blogs. I pin when I need a break, in between answering emails. I pin at night as the day winds down. Who knew pinning could be so relaxing! Create boards to collect ideas. Do you want to do a post about your favourite colours, say Pink and Red? Then devote a board to just that, like Christine did. Gathering ideas for future DIY projects or renovations? You can do that too. Promote your community. Who says you can only pin photos of objects? Why not pin photos of people? We did just that with our BlogPodium Bloggers board. 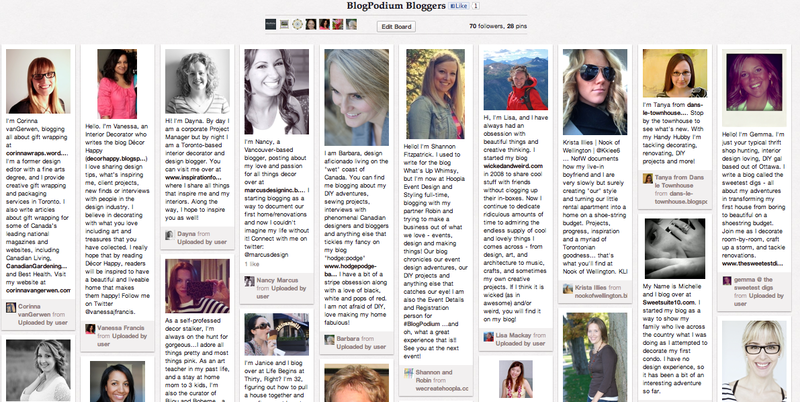 Its a great way to find new blogs and see the writers behind them. Modenus has done the same to highlight their BlogTour NYC Bloggers and AltSummit did it with their attendees. Show your stuff. It might feel a little weird at first, but don't be shy, PIN YOUR OWN WORK! Have a great before & after that you shared on your blog? Pin it! Did you write up a great tutorial about your latest DIY project? Pin it! Share it with your followers. Chances are, they follow you because they like your style and they'll enjoy your work. But don't use Pinterest only for self-promotion. Just replace my blog name with your blog name and you can see what people are liking. Its a great way to see which of your posts are popular - or not! My most repinned image? This one of Chloe's costume closet. For a fleeting few hours, it even made it on to the Pinterest Popular page! Drive blog traffic. Okay, this isn't really a "use" of Pinterest, but more an outcome of it. Pinterest is hot on the heels of Google as the biggest driver of traffic to blogs. When people pin an image to your blog, it drives traffic your way. When you gain followers on Pinterest, they may be inclined to click on your profile and check out your blog. When you leave a comment on a pin, just like leaving a comment on a blog, others may click on your signature and find their way back to your blog. Every interaction on Pinterest can lead people back to you. Just make sure to mention your blog in your profile! Find new blogs to read. Just like your pins can lead back to your blog, finding pins you like can lead you to new blog reads. You can't say the same about other social networking sites like Facebook or Twitter. Of course, you can waste hours pinning pretty pictures, but at some point, hopefully, one of your pins will inspire you to do a craft with your child. Or build something with your own two hands. Or dress yourself better. Or cook a new recipe. Or plan a memorable party. How awesome is that? Great post Jen!! Been loving the series and so glad you covered Pinterest!! Copyright is my only real beef with Pinterest too, I try and link the original source with a brief description every time, but sometimes you re-pin something that someone else has failed to source and it can be hard to track down the original author\photographer\owner. I like many folks use Pinterest to collect ideas for DIY and inspiration for the impending remodels on our house, as well as collect recipes I want to try & a style board etc. I just recently started pinning my own pictures&projects and am not too sure how I feel about that; it's really putting yourself out there to the judgment of the internet (which is not necessarily always a bad thing).